My heart has been squeezed and shredded, and glued and mended. 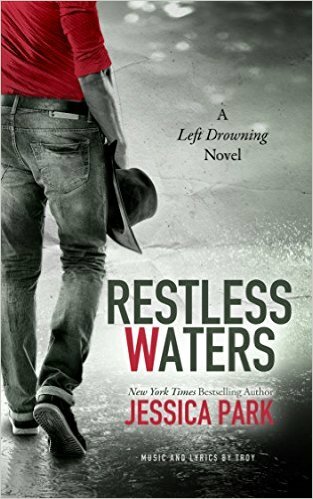 Restless Waters is filled with enough emotion to sweep you out to sea, unless you’re holding tight to someone. I have loved Sabin from the very first moment we met him, in Left Drowning. I knew there was more going on inside his head than he let on. I KNEW that his story, however it was told, was going to make me feel. I was so right. Blythe has found a way to breathe, with the love of Chris and Sabin. Sabin is her best friend. In fact, everyone would count themselves lucky to have a friend like Sabin. He is charismatic and loving, and loyal to a fault. He wants his loved ones to feel no pain. But as they grow closer, she notices that Sabin is falling apart. He wants to be free, but at the same time, he can’t stand being alone. If Blythe isn’t strong enough to save him, she’s going to drown right along with him. My heart was breaking this entire time. True to the Left Drowning feel, I had to step away from everyone, as I couldn’t contain the sobs that overcame me, at one scene. I was completely caught off guard and my heart squeezed so tight. I wanted Sabin to be happy. But no matter how loud and crazy he was, there was undercurrent within him, that you felt through the pages. Restless waters is the perfect description of him. He was all over the place. Never settled. He was hurting and helpless. After growing up the crazy household they did, there are bound to be scars that remain below the surface. Healing doesn’t happen overnight. It takes a lot of fierce love and compassion to prevent someone from drowning in sadness and pain. So hold on. Grab a box of tissues and get cozy. You won’t want to get up until you’ve finished. Read Left Drowning (Left Drowning Series Book 1) first, to fully understand where Sabin is coming from. This book is in my top 10 of all times. I have much love for this series.